A lumen is the unit of measure used to enumerate the amount of light coming out of a lightbulb. A watt is a unit of power. The wattage required to generate a lumen varies depending on the type of bulb. Incandescent bulbs are the least efficient of the household bulbs. Compact fluorescent lightbulbs (CFLs) and LED bulbs are significantly more expensive, but they are more efficient and last longer. 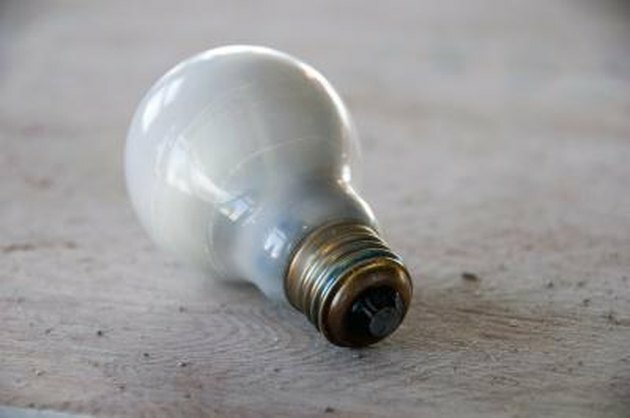 Divide a bulb's lumen output by the watts used to get a lumen-to-watt ratio. From there, you can calculate usage cost. Different bulbs provide lumens at different rates. Divide 1,500 by the wattage of your bulb. As benchmarks, for an incandescent bulb, an average wattage for 1,500 lumens is 100; for a CFL, the average is around 25 watts; for LEDs, the average is 18 watts. Thus average lumens per watt figures are 15 for an incandescent bulb, 60 for a CFL and 83 for an LED. Different brands of bulbs may have slightly different ratios. Determine the wattage for a single lumen in 1,500 lumen bulbs by dividing the wattage by 1,500. For the above-rated bulbs, the incandescent weighs in at 0.067 watts for one lumen. The CFL needs 0.017 watts for a lumen. The LED requires only 0.012 watts for a single lumen of light. Calculate the cost per 1,500 lumens by figuring in power costs. You need to add in a time factor to measure consumption. Use one hour, as that is the time base for the kilowatt-hour measurement used by utilities. Divide the watt figure by 1,000 and multiply the answer by your utility's kilowatt-hour price. For an average incandescent, at 16.5 cents per kilowatt-hour, 1,500 lumens for an hour runs 1.65 cents. A CFL and an LED would average around 0.41 cents and 0.30 cents, respectively. Do Night Lights Use a Lot of Electricity?